Native to Madagascar, the deep green, scalloped leaves of the kalanchoe are just as attractive as the flowers. The sculpted foliage persists after blooming and provides for a handsome plant. The starry flowers are long lasting and bloom in winter to spring, appearing in clusters at the ends of sturdy stems. The vibrant colored flowers come in red, orange, yellow, lavender, white, and pink. Some new varieties of kalanchoes even have bi-colored flowers. 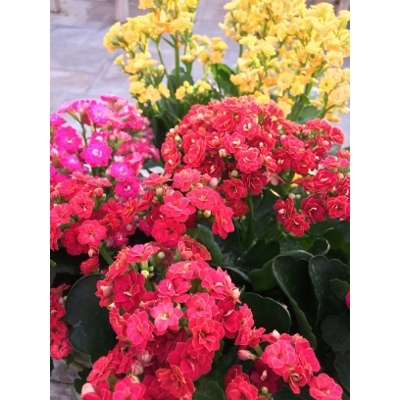 Kalanchoe plants require well-drained soil and mild temperatures of at least 60 F.
Little maintenance is necessary for kalanchoe care and the succulent has few disease or pest problems, especially when grown indoors. Kalanchoes make wonderful Christmas gifts since they will continue to bloom for years.